Samatva Yoga Sangamam started on dot at 6 a.m on 12 th January at Anandadham. Dr. M.V. Natesan Professor from Sri Sankara Sanskrit University, Kalady, Dr. Vivekanandan Retd Major General and Man. Lakshmi Didi were on the dais for the program. The program started with Vedic Hymn setting the tone of the program, followed by Ma. Lakshmi Didi’s welcome address. While talking to the students of yoga she highlighted Swami Vivekananda's concept of yoga and Ma.Eknathji contribution, making yoga as the core of Vivekananda Kendra in all its activities. The talk by the distinguished Professor let the tune for the flow of Samatva yoga. He did it effortlessly filling the minds of Samatva yoga students and made them feel the necessity for making yoga as part of their life, by giving number of similes. Given the minimum time for him, he did justice and filled their minds with inquisitiveness. The bonus came from retired Major Gen. Vivekanandan who spoke from his rich experience and encouraged one and all to make yoga a part of their being. This was followed by Samuhika Surya Namaskar led by Sri Joshi. To the tune of the ambience that was set by the distinguished guests, he created the tune of Samatva yoga and made everyone follow with breathing practices and Surya Namaskaram. The atmosphere was filled with vibrations of pranava chanting.285 members constituting yoga satra, varga, tailoring unit students and parents and students of Sandeepani Sishuvihar, took part. On the same day, Swamiji’s Jayanthi celebrations at Ananda dham, Kodungallur was planned at 10 am. 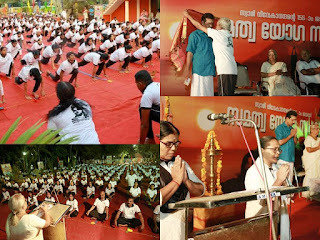 Dr. Lakshmi Piyush, HOD of Sanskrit department, Sri Krishna College, Guruvayur was the Chief Guest. She inspired the prize winners who had come for the celebration, with her fiery speech. Talking to the parents and teachers, she said that giving the powerful thoughts of Swamiji and other inspiring thoughts vibrating with truth to their wards right from their childhood, it could mold their wards’ characters, thereby making them good citizens. Prize winning students were awarded. This time Amrita Vidyalayam received the rolling trophy for patriotic group song whereas the Trophy for folk group song was shared by Shantiniketan International School and GUPS Konathukunnu. 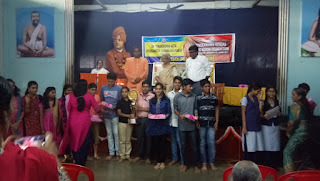 Eleven poor but meritorious students of GGHSS Kodungallur, five of them from class X and five from the XIth class were awarded scholarships worth Rs 500/- each and Kum.Nasreen of class Xi received the Sridevi Namboodiripad memorial scholarship worth Rs 1000/- for being best in studies. As usual prasadam(sumptuous lunch) sponsored by Mr and Mrs Murali, our close wellwishers, was distributed to all after the programme. On the 13th January Sishuvihar children along with SamskarVarga children celebrated Swami Vivekananda Jayanthi in their own special way. Dr. Sukumaran, an ayurvedic physician and a longtime associate of Kendra, was the Chief Guest. All we're blessed to have the august presence of a Swami from Ramakrishna Math Sri Satyatmakananda to bless the children. The program started with prayer and lighting the lamp by Ma Lakshmi Didi and Chief guest and little Ananth dressed as Swamiji. Didi addressed the parents emphasizing the need to sustain the values that are nurtured in Sishuvihar. Dr. Sukumaran too stressed the need for cultural education to be preserved for posterity. Rev Swamiji too gave his blessings. He appreciated the efforts taken by the parents and teaching staff in dressing up each kid as symbolic characters from the puranas e.g, Siva-Parvati, Rama-Sita Devi and Lakshmana with Hanuman, a dedicated farmer and his wife’s dinacharya, Sri Krishna,Sri Sankaracharya and so on. A Tableau by Samskara Varga children was highly appreciated by all. 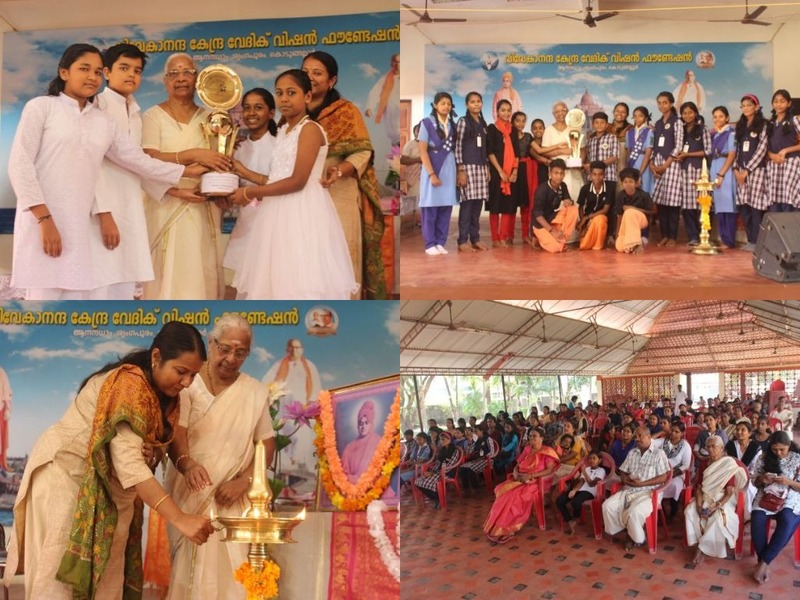 The theme was jala pralayam and the relief work by the voluntary organizations. Then each child presented their talents by uttering the sayings of Swamiji. The efforts taken by the parents and teaching staff was highlight of the day. The program ended with Shanti mantra. 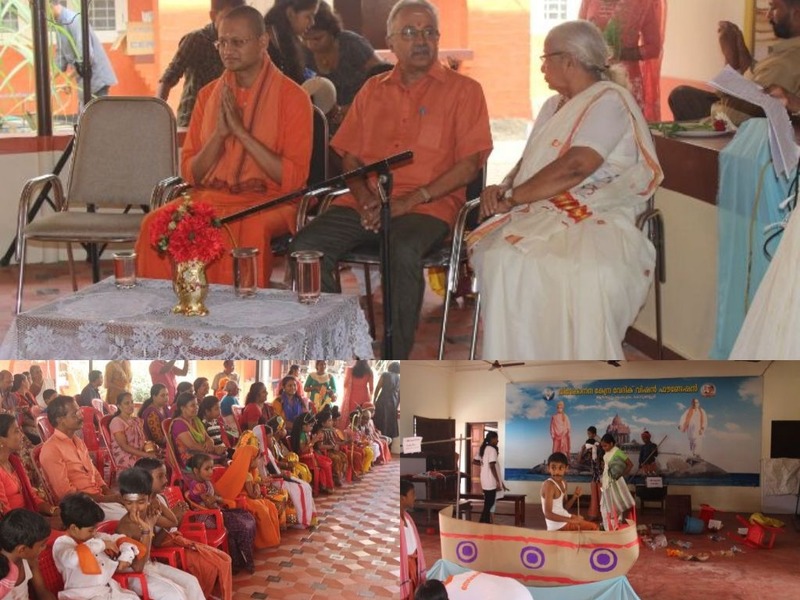 On 3rd February, Swamiji Jayanthi was celebrated jointly by Sri Ramakrishna Math Thrissur and Vivekananda Kendra Vedic Vision Foundation-Kodungallur at Vivekananda Vijnana Bhavan, Punkunnam Thrissur. The programme started at 4pm.with Vedic prayers followed by deepa prajwalanam by Rev Swami Nandatmajananda, Dr Jijin Krishna and Mananeeya Lakshmi Didi. Dr Jijith Krishnan (Associate Professor of Medicine, Govt.Medical College, Thrissur) was the Chief Guest. Mananeeya Lakshmi Didi presided over the function.Sreemad Swami Nandatmajanandaji gave the benedictory address. In her presidential address Lakshmi Didi introduced Vivekananda Kendra and its activities and thanked Sri Ramakrishna Math for giving an opportunity to start the activities at Thrissur. She drew the attention of the parents and teachers in inculcating the values in the students so that strong foundation is laid down in them. The Bharatiya Vidya Bhavan, Pottore school children who presented an excellent patriotic song we're the first prize winners in patriotic song competition. Dr. Jijin Krishna, Asst. Professor at Thrissur Medical College, gave an inspiring speech drawing number of incidents from Swamijis life, gave titbits to mould the life so that all can become worthy children of Swamiji. Paramekkavu Vidya Mandir was in the third position. The winners of Quiz competition were Paramekkavu Vidya Mandir in the first position, Chinmaya Vidyalaya in the second position and Bharatiya Vidya Bhavan Poochatty in the third position. The best all round rolling trophy for the best performing school went to Paramekkavu Vidya Mandir. While giving his benediction Sw. Nandatmajananda encouraged the children to adopt the teachings of Swamiji and mould their life so that they become ideal children of Mother India.